Makki di Roti te Sarsaon da Saag! Lohri is one of the festivals I respect from the core of my heart! Celebrated mainly by the Punjabi community, Lohri is a festival to celebrate Girl Child and their existence! I am a mother of a girl child and for me, my little one is nothing but priceless. I was determined that this year there should be a Lohri special recipe in my blog but failed to post it on the day of Lohri as I was busy with the makeover of the blog yesterday but better late than never. And here is my Lohri as well as winter special “Makke di Roti te Sarson da Saag”! 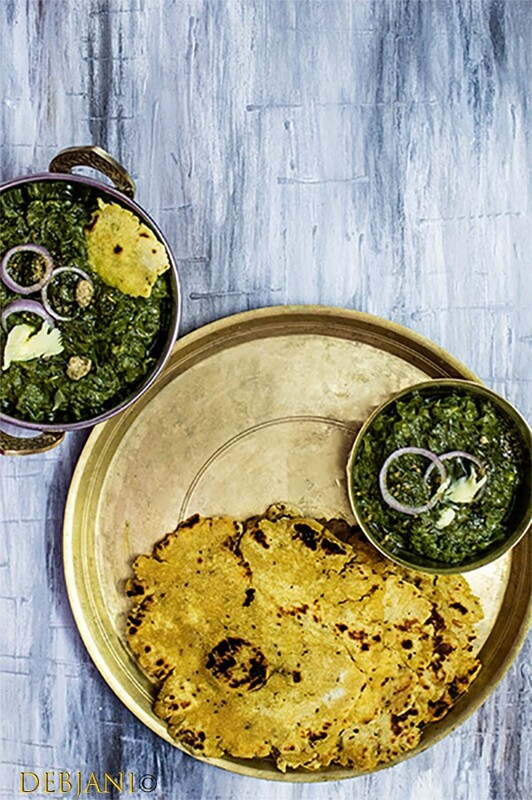 I personally love to have Sarson ka Saag, especially in Gurgaon’s freezing weather. This is one of the popular foods prepared during the winter in North India. 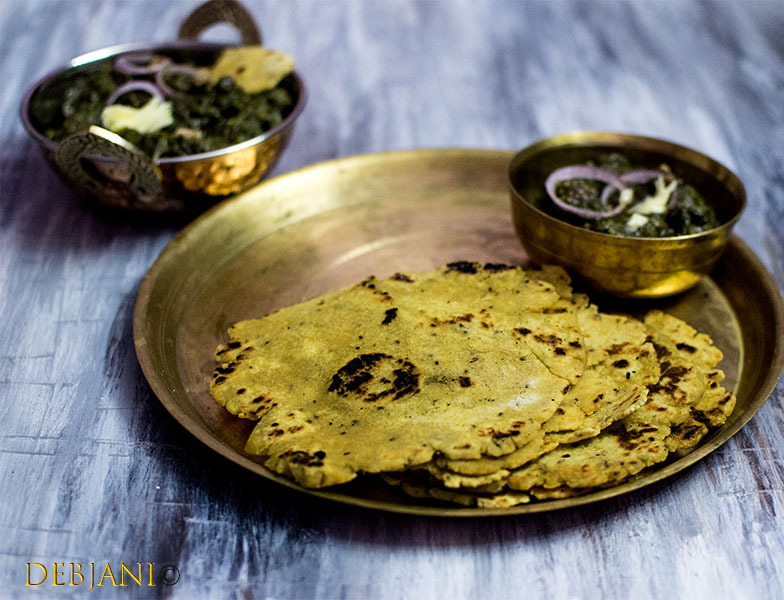 It’s really easy to prepare this traditional Dish with Mustard leaves which are served mainly with flat bread prepared with Corn meal (not cornflour!) known as Makki ki Roti. Wash both Mustered leaves and Spinach under running water at least 7-8 times. Now roughly chop both the veggie and take those in a large bowl. Add sufficient water to cover the leaves and start boiling it on the medium flame for around 8-10 minutes. Drain the water and make a smooth paste of the leaves. Now take half of the Ghee in a thick bottom pan and heat it properly. Add chopped onions and fry for around 3-4 minutes in medium flame. Add both Ginger and Garlic paste to the onion. Sauté’ for around 2 minutes and add salt to the mixture. After adding the Saag pastes add chopped Green Chillies and mix it well. Now add 2 Tbsp. of Cornmeal to the mixture and sauté for 2 more minutes. Check the salt and if required adjust it now. Don't cover the bowl and cook on low flame for around 15-20 minutes. Add rest of the Ghee and switch the flame off. 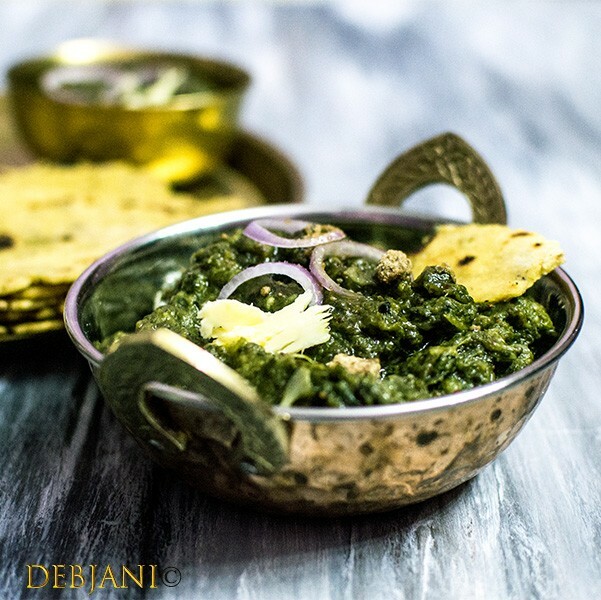 Though the name of the dish is Sarson ka Saag, however, Spinach is also another important ingredient used in this recipe. In fact, some people prefer to add Bathua Leave to their Sarson ka Saag. The ration for Mustard leaves and Spinach is 2:1 which means for 1 bunch of Mustard leave a ½ bunch of Spinach to be added. If you wish to add Bathua then add a ½ bunch of Bathua in addition to Mustard leaves and Spinach. I don't like Bathua and hence skipped that. I don’t pressure cook veggies while preparing Sarson ka Saag or Palak Paneer! You will get a pale green color if a lid is used while boiling the leaves! I don’t like to follow any shortcut while preparing Sarson ka Saag! I prefer to keep my Sarson ka Saag Simple hence skip adding any spices such as cumin powder or Garam masala. Though I have used only Ghee, however, Ghee can be totally substituted with Vegetable or Olive Oil to cut the Calorie. In fact, I mostly use Vegetable oil while preparing it as part of my normal food and add ½ Tsp. Ghee to finish it. Corn-meal: 3 Cup (300 g). Jowan/ Ajwain/ Carom Seed: ½ Tsp. Take Cornmeal in a bowl and add Carom Seed and salt to it and mix using your hands. Now add little warm water and start kneading it. It took me 1.5 Cup of warm water to prepare a tight dough. Cover the dough with a wet cloth and leave it for 30 minutes. After 30 minutes knead the dough again for 5 more minutes. Make 8-10 Balls out of the dough. Now start roasting Roti using a Tawa or Flat Frying Pan on high flame. Don't reduce the flame while making Makki Di Roti! Add ½ Tsp. of Ghee to each Roti while Roasting! For the authentic flavor, there’s no less calorie version available! 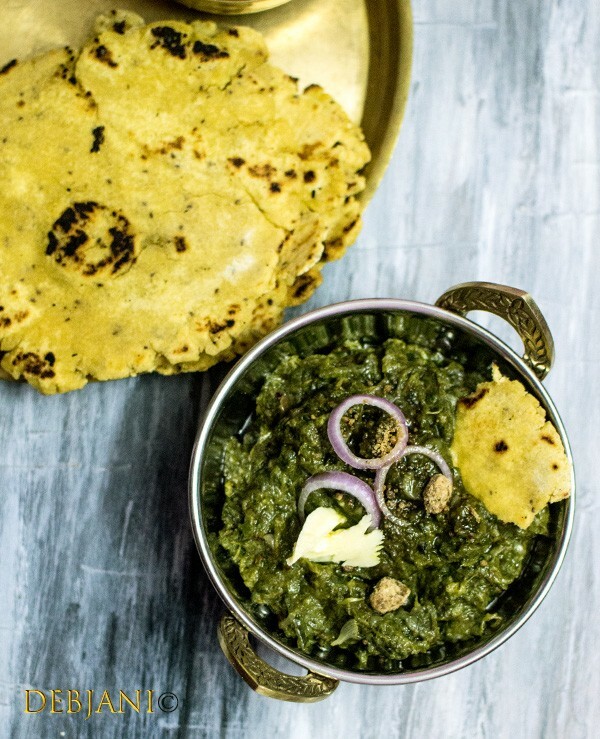 Serve Makki ki Roti with Sarson ka Saag and believe me the taste is heavenly! It’s a bit tricky to roll the Makki Dough! 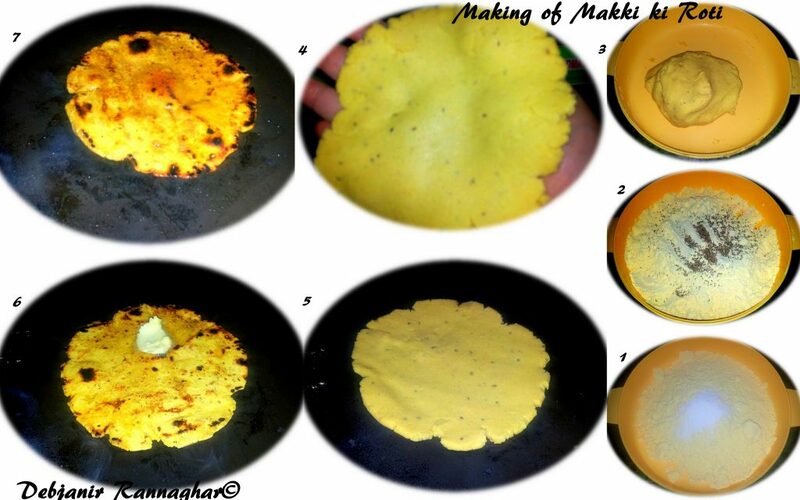 Traditionally Makki ki Roti is prepared by pressing the dough but not using a rolling pin. If you’ll not be able to prepare flatbread using your hand then take two pieces of cling film and place the dough ball within and using a rolling pin roll a medium size Roti/ Flat Bread. 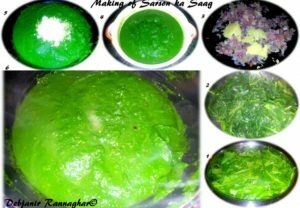 Sarson Ka Saag aur Makki ki Roti pictures updated in 2017.